What changed, what remains the same. 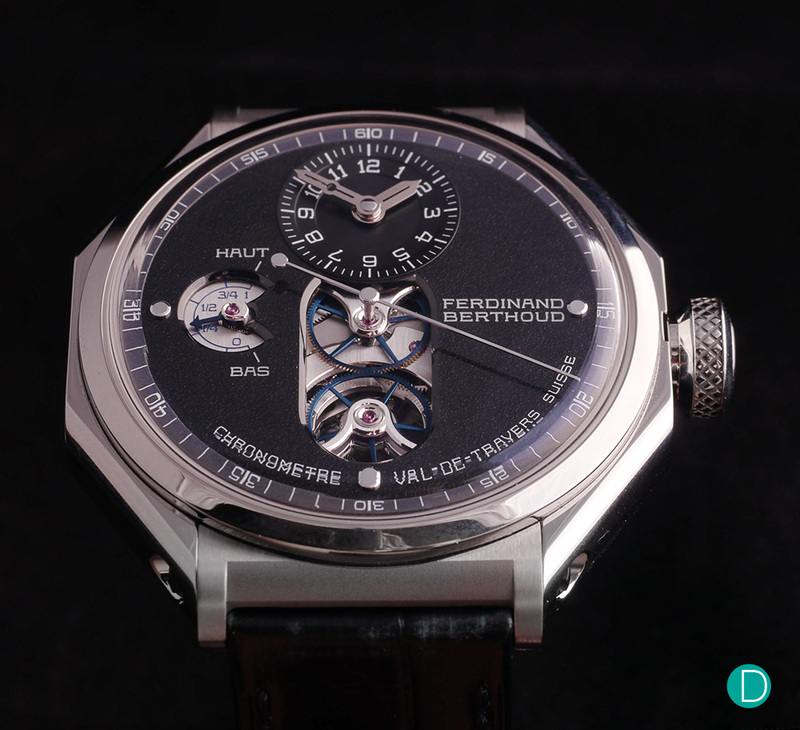 We covered the launch of the Ferdinand Berthoud FB 1 in detail with a full hands-on ;review prior to the official launch. We subsequently chatted at length with CEO Karl-Friedrich Schuefele (link is part 2 of a 3 part interview) on the philosophy behind the brand and the motivation that drives it. The collection was further updated with the FB 1.2 in a white gold case, and then the FB 1.3 in a platinum case. 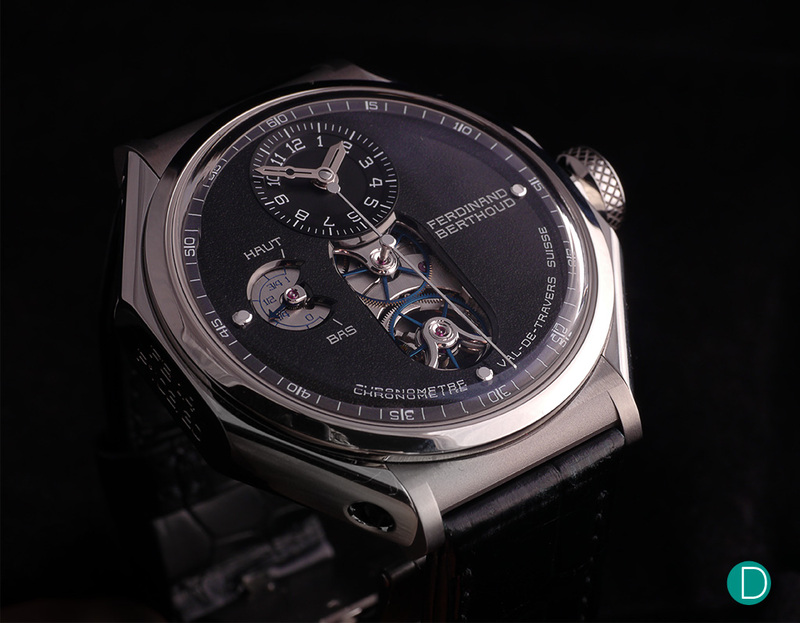 We now arrive at the latest of the series: the Ferdinand Berthoud FB 1.4, which is clothed in a titanium case. The Chronométrie the Ferdinand Berthoud watches are not mere tribute, a reproduction or even a reinterpretation of the original created by Berthoud. The work cut out for Karl-Friedrich Schuefele and his team is far more demanding. 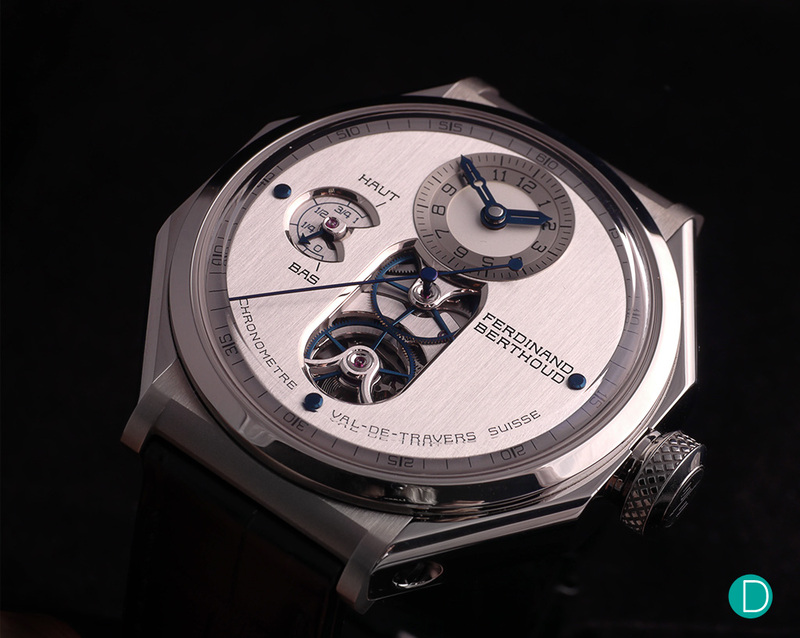 It involves translating the quest and thirst for chronometry by F. Berthoud into a watchmaking language which is contemporary, and represents what he might have done if he was still living today. Hence, the evolution of the timepieces are naturally a painstaking process to ensure that this essential guiding philosophy is adhered. The F. Berthoud FB 1.4 is available in two versions: one with a bead blasted, black laquered galvanised brass dial, and the other in a vertical satinated silvered galvanised brass dial. The basics of the watch in the series carry the same familial traits. The design throughout the series is similar. A base round case within a octagonal outer case to simulate the aesthetic feel of the marine chronometers made by Ferdinand Berthoud. 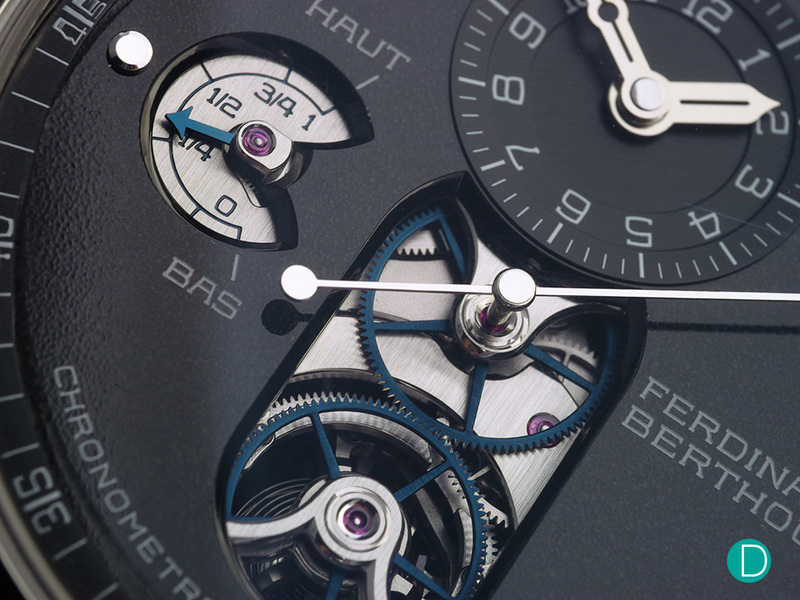 The use of a suspended reverse fusée and chain system to power the tourbillon, visible via a cutout on the dial also remains. The unique conical power reserve indication system is retained. The case material remains the main differentiation from FB 1 to FB 1.2 to FB 1.3. The FB 1 being in white gold, the FB 1.2 in rose gold for the more romantic feel. And the FB 1.3 in platinum. The F. Berthoud FB 1.4 with a black dial. Attention to detail remains unchanged. For example in the FB 1.3, a special technique is developed to prevent the platinum to platinum contact surfaces from bonding to each other. The simple solution is to apply a grease, or to use a sleeve made of another metal, but this goes against the grain of the Berthoud philosophy. F. Berthoud FB 1.4-2 with the vertical stain brushed silver dial presents a second look to the same version of the watch. For the fourth version, the FB 1.4, Karl-Friedrich takes a bit more liberty, having already fulfilled the classical requirements in the earlier editions. The black dialed version takes on a different personality from the silver one. Visible on the side is the absence of the porthole on the case. Firstly, the case is made of titanium. This affords the case a certain lightness of feel as compared to the heft of the its brethren. And to achieve the differential effects of the surfaces on the case, Berthoud elected to use two different titanium alloy. The case body is in grade 5 titanium, and the lugs are in grade 2 titanium. The body is polished, and the lugs brushed. The polish acheived on the case body is akin to black polish used on flat surfaces on steel parts typical in many high end watches. It is also similar to the famed zaratsu finish used in Grand Seiko watches. The combination of two grades of titanium with their subtly different hue and the different finish techniques provides a visual diversity, and breaks the monotony of the grey metal. A dynamometric coupling system is used to bind the titanium with black ceramic medallion to create a further visual cue. The case side, showing the lack of a porthole on the Berthoud FB 1.4, and the crown. Also visible is the blackened titanium lugs which hold the lugs to to the case. Secondly, the side portholes reminiscent of those in the ships which Berthoud’s Marine Chronometers would be located are gone. This is a key design element which is deleted. The overall look is one which is altogether more modern as well as more sleek and streamlined. It also affords the watch a little more discreetness, and a touch more understatement. 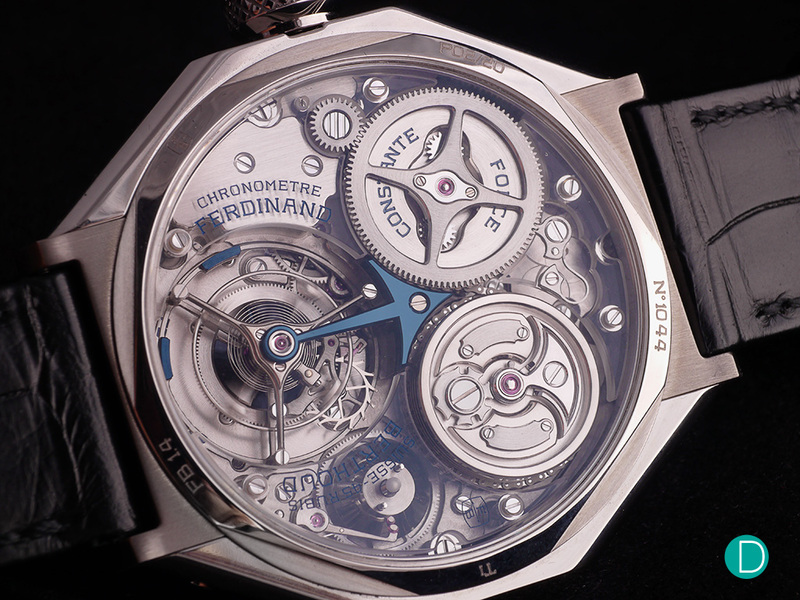 The german silver plates are replaced by sapphire glass ones which throws light into the movement. Thirdly, the german silver movement plates, as visible through the sapphire case back is also changed to make way for sapphire crystal bridges. These bridges throw the watchmakers a very significant challange. Not only is sapphire glass very hard (second in hardness only to diamond) which makes it very difficult to work with, the team chose to provide anglage to the edges of the bridges, retaining the classical metal (often brass, or as in the case of the other FB 1 watches, in german silver). This anglage is provided with a frosted finish mechanically applied so as to contrast to the shiny surface of the sapphire. The glass is also hand engraved to provide the markings of the brand and other text. The sapphire glass bridges are anglaged and polished to provide the same aesthetics as the german silver ones it replaced. A total of three sapphire bridges are used. The movement remains the same. Well, mostly. 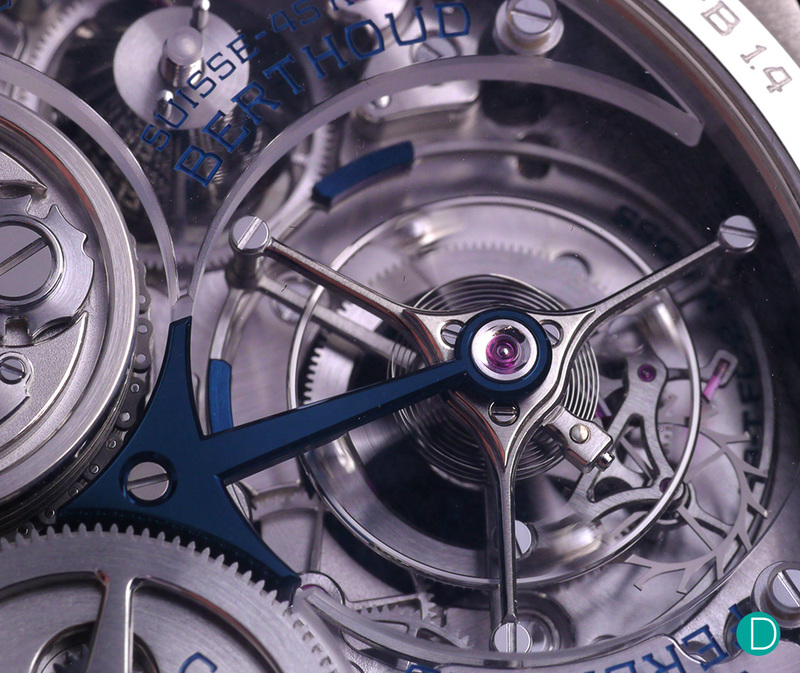 As mentioned above, the movement bridges are now made of sapphire glass instead of german silver. The same pillar construction method is used, but in the Berthoud FB 1.4, the pillars are in titanium and stylised, as they are visible through the sapphire bridges. In earlier versions, they are in precious metal, and visible through the portholes at the sides of the case. The texture of the bead blasting can be seen through the black laquer. 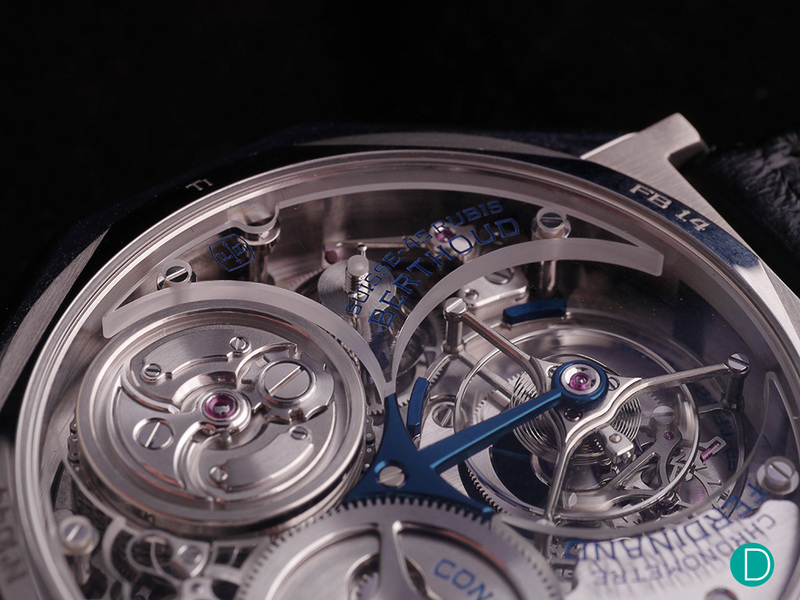 Also note the two blued wheels – the tourbillon cage which drives the central seconds hand. The attention to detail. For example in the black dialed version, known as the Berthoud FB 1.4-1, the dial is a galvanised brass base. 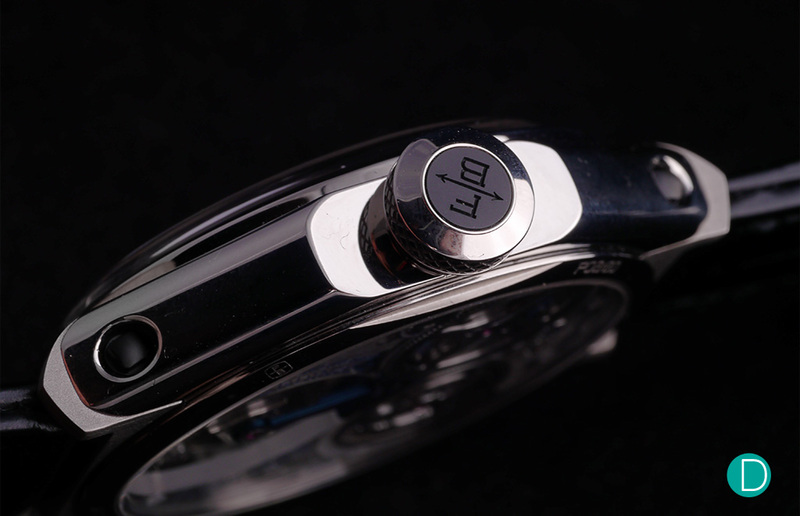 The dial is subjected to a mechanical bead blasting to create a textured surface. And then several coats of black laquer is applied to create the effect. The final aesthetic is one which is very pleasing, as the dial is at the same time textured and shiny. The movement finishing remains top level, with even the minutest of details being carefully attended to. The magnificent finishing. The finishing of the Berthoud watches have always been one at the top of the game. And the 1.4 is no different. all the traditional aspects of fine finishing is executed to the highest levels. 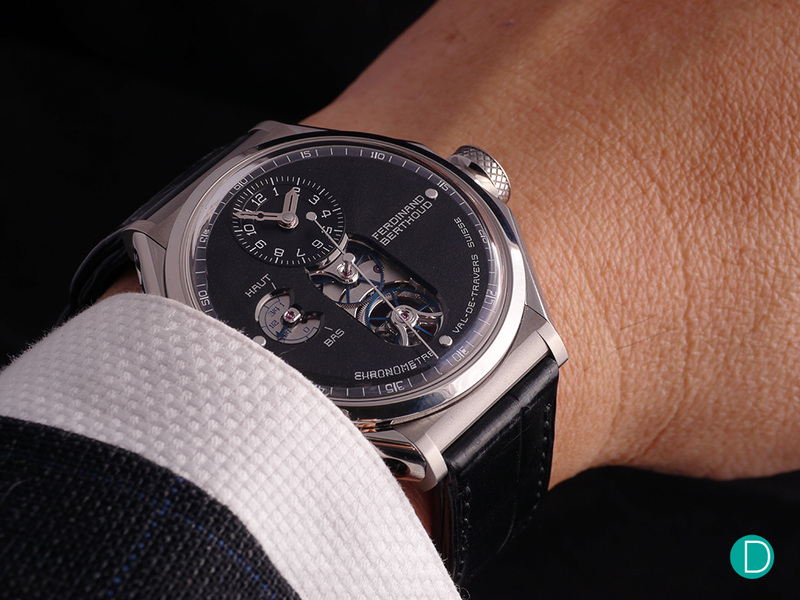 On the wrist, the titanium case feels delightfully light, and the 43mm case diameter is almost perfect for the masculine wrist, and may fit many a feminine one too. At 43mm in diameter, and a scant 7.96mm thick, the watch feels light on the wrist as compared to the earlier versions’ heft. Both have their attraction. A hefty watch can feel good on the wrist, and so can a light one, and in the case of the Berthoud FB 1.4, the lightness translates to a delight. The case size and dimension is a perfect fit for the masculine wrist, and for many a feminine one as well. We were told that the first two FB 1.1 in Singapore were sold to lady collectors who marvel not only at the technical aspects of the watch, but also the immensely powerful aesthetics. In a non-precious metal, the Berthoud FB 1.4 remains noble and elegant. 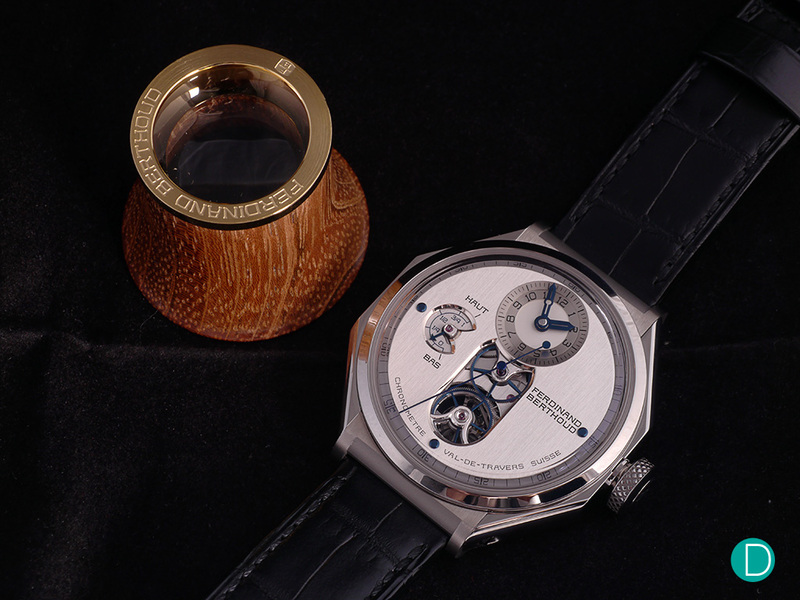 Apart from the beautiful watch which is presented, we also admire the tenacity of Karl-Friedrich Schuefele in sticking to his guns and ignoring commercial concerns in this pet project of his – to recreate the dream of Ferdinand Berthoud. We discussed many interesting things with him during his recent visit, and will soon share with you his latest thoughts on Chopard (where he is co-president with his sister Caroline) and on Berthoud. Watch roll of the F. Berthoud FB 1.4-2 the FB 1.4-1 and the FB 1.3. 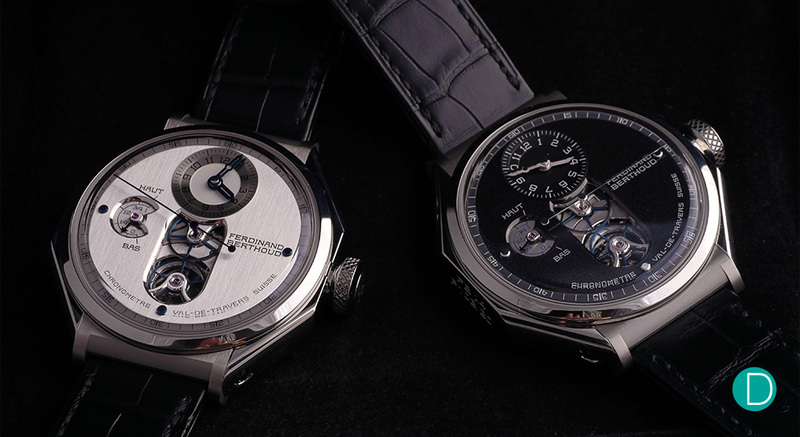 More info on the Ferdinand Berthoud website.